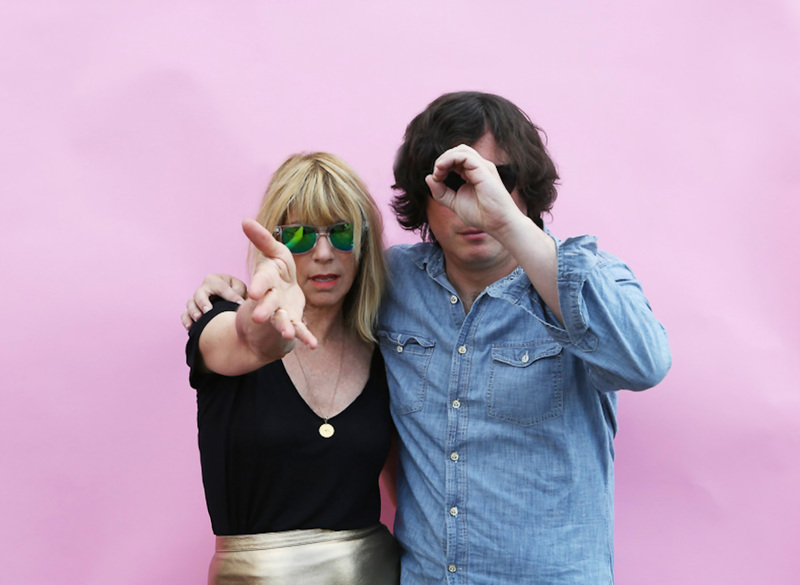 Body/Head are an electric guitar duo comprised of Kim Gordon (CKM, Sonic Youth, Free Kitten, etc.) and Bill Nace (X.O.4, Vampire Belt, Ceylon Mange, etc.) They began working together in various loose formats a few years ago, but the Body/Head concept evolved more specifically in early 2012. Initially their approach was largely instrumental—lattices of interwoven feedback rainbows, with bits recalling everyone from Heldon to Keiji Haino. They often performed against a backdrop of slow-motion film projection, creating a dream narrative of undeniable power and visionary reach. Kim’s voice began creeping more into the mix, and the vocals are now an intrinsic part of their musical architecture. They have even started writing and playing “songs”, compositionally distinct from their purely aleatory origins, but still featuring lots of built-in improvisational space. Body/Head have recorded a single for Dennis Tyfuss’ Ultra Eczema Editions, a tour EP for Nace’s own Open Mouth Productions, and released a collaboration with Dead C’s Michael Morley through Feeding Tube Records. Their debut LP, Coming Apart, will be released by Matador Records on September 10. The title of the first track to Body/Head’s debut album confronts listeners with a fundamental paradox: “I Can Only Think of You in the Abstract.” Thought – as opposed to experience – is necessarily an abstraction. This tension exemplifies the psycho-acoustic logic of drone music. Thinking entails memory. It drags you back in time, away from the present, away from the immediacy of perception. And time exacts a heavy toll on the conventional musician: scales, the metronome, repeating passages until they can be played to perfection. In contrast, Kim Gordon insists she never learned to play guitar or bass. That suggests a different set of priorities. Bill Nace is the other half of the group. Their format is two guitars plus vocals. They always improvise. Gordon sings, but treats her voice much like an instrument by running her mic through a guitar amp and a string of effects boxes. Everything revolves around the drone, the improvisational constant. A drone can be an extended note or chord. Of course, it has to begin and end like any other note or chord, but if it goes long enough, it addresses the listener’s attention differently. Rather than becoming an object of attention, droning makes the listener the object of its effect. Melody and phrasing become less important. The concreteness of the sound asserts itself in terms of timbre, texture and volume. Thus, the sound assumes a spatial dimension. It abolishes abstraction. Instead of movement between passages, the musical dynamic becomes one of modulation. The two-guitar format offers a textbook case of this relationship: while one provides a steady tone or repetitive motif, the other modulates. Delta blues guitar, especially open-tuning slide work, offers a rough model for this. Another model could be the synthesizer which produces tonalities by combining wave forms. Different oscillations result in different tones. This analogy, of course, only goes so far because guitar tones are intrinsically more complex than, say, sin waves. Droning is more a question of sensibility than it is virtuosity. One starts somewhere – at any point, then responds to it. Loopers and effects pedals such as distortion, delay, chorus and fuzz units open up a wider array of possible modulations plus seemingly amorphous sounds, ranging from raga-like total immersion to symphonic swells. Effects change the function of the equipment. The transparent reproduction of sound is no longer the goal. Instead the character of sound includes the technology, namely the amplifiers and speakers, that generate it. Twisting a knob or pressing a button takes you to another place. Yet your body is there. Repetition is key. The same sound comes back slightly different. The modification is ongoing. Despite–or perhaps because of–amplification, it achieves a state that is concrete yet meditative. Gordon’s vocals toy with what might a song might be – or how it might disintegrate. Sometimes they emerge as a childlike singsong, laid over a skein of guitar work. Other times, her delivery is provisionally bluesy, testing the legacies of what this or that inflection might residually harbor. More often, the singing floats ethereally, distilled into a disembodied echo. Song brings words into play. Words, in turn, knit otherwise errant sounds into a cohesive whole that begs to be remembered and repeated. “Black Is The Color,” for example, glimpses a nightmare transcendence that goes to the ineffable core of what goes by the name of love. The word collides against itself: “…I love my lover…” In “Murderess,” Gordon monotonously intones the phrase “…by the sea…” over a racing, Giorgio Moroder heartbeat, while in “Last Mistress” – another female persona – she flirts with Yma Sumac trills offset by cataclysmic orchestral crescendos. Hearing drone music live has a ritualistic aspect. Drone musicians always preach to the converted. The question of quality is beside the point, because the assembled multitude wants nothing less than to open itself up to a collective experience, the possibility of simply being present together. Droning enables the audience in some way to be itself – which contradicts the implication of almost every message or image mass culture aims at it. Recording an improvisation and putting it onto CD offers a comparatively more private, individualized experience. Even so, it serves a common reference point for otherwise far-flung fans, a starting point for a common discourse, abstract though it may be. Here, even trivial choices like headphones versus speakers can be key. One puts the music inside your head; the other, outside your body. For me, listening to these recordings means dropping everything else I might be doing – not necessarily for the sake of concentration, but just to be able to co-exist with the music. But it’s not always the same for everyone. I played a cut for one of my students. She said it would be great music to study by.